The Senate on Wednesday averted a row on its floor, following arguments over membership of the old Peoples Democratic Party (PDP) and the Abubakar Baraje-led faction, New PDP. 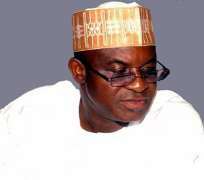 Sensing that situation might spiral out of control, Senate Leader, David Mark, quickly mediated, assuring his colleagues that so far as the party remained one, the upper legislative chamber was not in a position to decide who its head was. Satisfied that the two warring camps still claimed the party membership, Mark called for calm on the floor to enable the chamber to concentrate on its duties. 'I am satisfied that Goje said he was still in PDP. The issue of chairmanship is not for us to decide,' he said. Adeyemi noted that it was offensive for Goje, who has served as a governor and still serving as a lawmaker on the PDP's platform to support a faction in the party. He, therefore, urged Goje, not only to withdraw his statement but also to tender an unreserved apology to PDP members for using offensive language against the party. The furore evokes memories of the row by members of the House of Representatives over the division in the People's Democratic Party (PDP) few weeks ago.